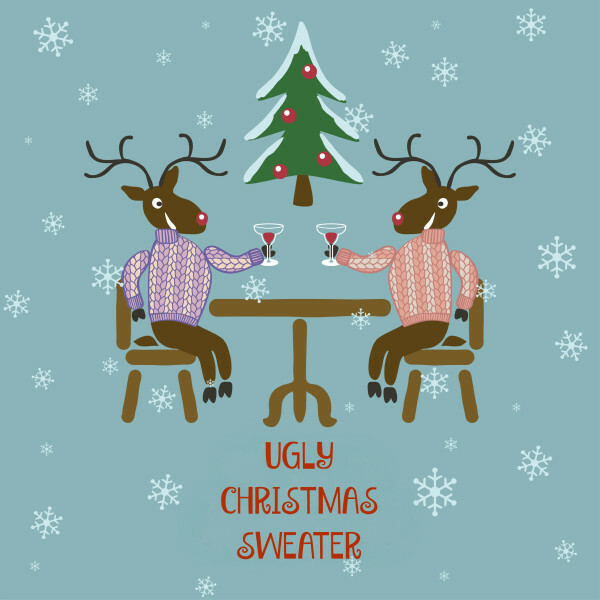 Ugly Christmas sweater is in the eye of the beholder… what’s an ugly sweater to one person, may be beautiful Christmas sweater to someone else. Nah, ugly Christmas sweaters are UGLY Christmas sweaters, but the ugly sweater trend has become a thing of beauty! You can go to ugly sweater parties or compete in ugly sweater contests, where the tackier the better, because if you want to win, you really have to wear the tackiest and ugliest sweater. Or maybe you can participate in an ugly sweater swap – where everyone gives someone else an ugly sweater of their choosing. I love the idea of shopping for an ugly sweater for friends and family. That’s why I love this, ‘Which Ugly Christmas Sweater Are You?‘ quiz! I can have my ugly sweater recipient take the quiz and then I’ll be able to match them up with their perfect sweater. Plus it’s just fun to take it. Let’s see, I got ‘Sweet Gingerbreads!’ I do like gingerbread cookies. I’m usually ready for anything. Who doesn’t love a good snowball fight? I haven’t gone caroling in long time, but it is a lot of fun and I LOVE being a secret Santa. Not sure if I would say I am the life of any party, though, but this does sum me up pretty well. Since I don’t actually own an ugly Christmas sweater (I know, I need to rectify that), I’ll be looking for one with some gingerbread men on it. Although, I think any Christmas related themed sweater will do. Just as long as it’s ugly! Because I’m in the holiday spirit I want to spread a little cheer and do a giveaway! Enter on the Rafflecopter form below for a chance to win $20 PayPal cash! Giveaway ends 12/18 at 11:59 pm EST. Good luck! I’d love for you to take the quiz and share your ugly Christmas sweater personality with me in the comments! 41 Responses to What’s Your Ugly Christmas Sweater Personality? Find Out Here! Take the “Which Ugly Sweater Christmas Are You?” Quiz and then leave a comment telling me what your results were along with your email address to contact you with if you win! Sweet Gingerbreads! The life of the party, you’re ready for anything, a snowball fight, caroling, being someone’s secret Santa. And this sweater has almost everything on it. You believe anything is possible, and you know you’re the one to make it happen. Just like the reindeer taking flight on the chest of this sweater, nothing can stop you. I got Sweet Gingerbreads! Love it, thanks for sharing! I got Rudolph. Yay! Face it — you’re a bit of a sap. You love all the sweet aspects of Christmas, especially the fun Christmas carols and those antler/red nose car decorations. You have a Christmas-themed Pandora station ready to roll in October. I got the “Flying Reindeer” ugly sweater…which is funny because, I actually like the sweater! I love “ski sweaters”, or “sit-in-front-of-a-fire” sweater! I have never worn an ugly sweater, it isn’t usually cold enough to wear one. Apparently Here’s Rudolph is my sweater of choice. It’s actually quite cute and it would be perfect for a sweater party. I got Sweet Gingerbreads, too. I have an ugly Christmas sweater my m-i-l gave me as a gift a few years ago, but it wasn’t intended to be an ugly Christmas sweater. LOL! I took the cute quiz and got Here’s Rudolph as my ideal ugly Christmas sweater. Some of the questions totally made me laugh out loud! Argyle Santa! was what I got. I love Santa so it fits. Oh, what the heck, what’s a closet full of the same sweater? Snowflake Stripe! The simple row of snowflakes across the chest reflects your desire to live a simple life: Understated clothing, gift cards for everyone, spiked eggnog – that’s your idea of a good holiday. Haha what a fun quiz! I secretly love ugly Christmas sweaters. lol I am Sweet Gingerbreads! I got Rudolph. That is so spot on, and I loved the sweater lol. I do not own an ugly Christmas sweater, but I have to admit to loving them. I think they are so fun! I’m scared to know what my personality type would be! The whole ugly sweater thing is so funny to me. The uglier the funnier I think. This is hilarious. I need that holiday cheese ball! This is what i got Argyle Santa! You tend to be on the formal side of things, preferring to remain crisp and clean, even when chugging eggnog. But you’re also generous, and the presents you give tend to be some of the best in your family. LOL this is true i enjoyed answering the quiz. How fun. I got sweet gingerbreads too. Lol I love ugly christmas sweaters so I thought this was just too fun! This is a great quiz. I got Sweet Gingerbreads. My Son has been on the lookout for an ugly Christmas sweater to wear for the holidays. I loves this ugly sweater quiz! I’m a Flying Reindeer too, fun! How funny – I just ordered one. I’ll have to read that in its entirely later on today. I think its so funny to wear them – it keeps everyone in a much better festive mood at parties. I got Here’s Rudolph. That was a fun one! Now I just need a Rudolph sweater. I got the Gingerbread personality as well! This was such a fun quiz to take! It looks like you and I are in good company…each other!! i got Argyle Santa!. looks funny too. thanks and my email is in the form. Just as this sweater is meant for layering, you have many layers of your own. Among the facets of your personality is a desire to be left alone as much as possible, which isn’t always easy during the holidays. Maybe this sweater will help. I got the Argyle Santa!